British Prime Minister Theresa May on Thursday embraced U.S. President Donald Trump as a friend and ally, but cautioned him not to turn his back on global institutions and long-established political values. On her first visit to the United States as prime minister, May called the start of Trump’s term “a new era of American renewal” — but firmly rejected the president’s suggestion that torture might be acceptable, and rebuffed some of his foreign-policy views. May flew to Philadelphia a day before she will hold talks with Trump at the White House and become the first foreign leader to meet the president since his inauguration. Britain and America will never again invade foreign countries “in an attempt to make the world in their own image”, Theresa May has said in the biggest shift in UK foreign policy for more than 20 years. Addressing US Republican politicians in Philadelphia, the Prime Minister pledged not to repeat the “failed policies of the past” in a clear reference to the invasions of Iraq and Afghanistan by Tony Blair and George W Bush. Her comments are a repudiation of the doctrine of “liberal intervention” set out by Mr Blair in a speech in Chicago in 1999. Mrs May’s speech came as she prepared to become the first foreign leader to meet Donald Trump in the White House and begin talks on a major new free trade deal to be announced after Britain leaves the European Union. She made clear that Britain and America will now forge a new Special Relationship which will ensure that the rise of Asian economies like China and India does not lead to an “eclipse of the West”. And she vowed to address the aggression of Russia and the “malign” influence of Iran in the Middle East. Travelling to America on Thursday, Mrs May insisted that she will bond with Mr Trump in spite of their personality differences, saying that “opposites attract”. However, there were signs of policy differences between the two leaders. Mrs May said that she “condemned” torture and suggested that Britain could limit its intelligence sharing with the USA because of Mr Trump’s support for waterboarding. In her speech Mrs May, who was given a standing ovation by the audience, said that Brexit and Mr Trump’s election are an opportunity to “renew” the Special Relationship, which she described as “one of the greatest forces for good the world has ever known”. And she hailed Mr Trump’s election as “dawn breaking on a new era of American renewal”. She told Republicans: “I speak to you not just as Prime Minister of the United Kingdom, but as a fellow Conservative who believes in the same principles that underpin the agenda of your Party. “Principles instilled in me from a young age. Principles that my parents taught me in the vicarage in Southern England in which I was raised. In her first significant foreign policy intervention since becoming Prime Minister, Mrs May said: “It is in our interests – those of Britain and America together – to stand strong together to defend our values, our interests and the very ideas in which we believe. Her comments suggest that Britain intends to continue targeting jihadists using drone strikes but that “boots on the ground” invasions are now a thing of the past. Mrs May made clear that a stronger alliance between Britain and America can ensure that the two countries are able to compete with Asian economies like China and India. “But there is nothing inevitable about that. Other countries may grow stronger. Big, populous countries may grow richer. And as they do so, they may start to embrace more fully our values of democracy and liberty,” Mrs May continued. Despite the positive relationship between Mr Trump and Vladimir Putin, Mrs May used her speech to criticise Russia. And she sounded a warning over the negative influence of Iran in the Middle East. She said: “There is nothing inevitable about conflict between Russia and the West. And nothing unavoidable about retreating to the days of the Cold War. But we should engage with Russia from a position of strength. “And we should build the relationships, systems and processes that make cooperation more likely than conflict – and that, particularly after the illegal annexation of Crimea, give assurance to Russia’s neighbouring states that their security is not in question. “We should not jeopardise the freedoms that President Reagan and Mrs Thatcher brought to Eastern Europe by accepting President Putin’s claim that it is now in his sphere of influence. Mr Blair has faced years of criticism for his policy of “liberal intervention”, most notably over the Iraq war, which resulted in the Chilcot Inquiry. In notes sent to President Bush in the run-up to the Iraq war, Mr Blair said that it would be part of a bigger push to “spread our values of freedom, democracy, tolerance and the rule of law” across the world. British PM May Praises Trump, But Has Strong Words Too. 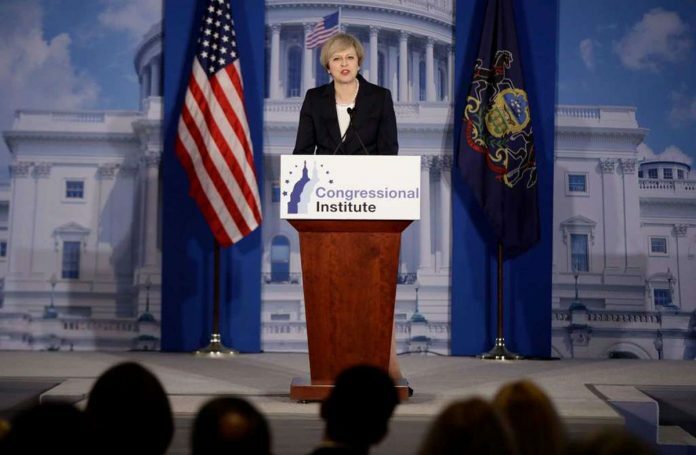 Theresa May emphasized the importance of the relationship between the UK, US.